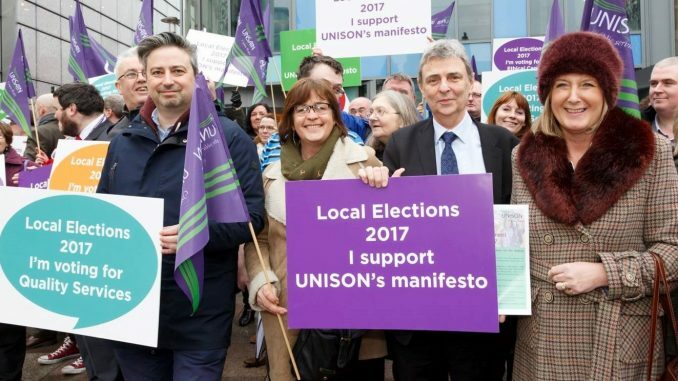 Investing in public services and strengthening communities must be the priority for all political parties, according to a manifesto published this week (Wednesday) by UNISON, ahead of the Welsh local elections. UNISON general secretary Dave Prentis joined more than a hundred public service workers including carers, caretakers and refuse collectors outside Cardiff Central Library for the launch. Commenting on the manifesto, Dave Prentis said, “Spending cuts forced by the Westminster government have run down local services and damaged communities– and Welsh people have had enough. It’s time for a new era of investment in local government services to strengthen communities. “There must be no more cutting back on bus services, refuse collections and social workers who keep children safe. No more closing libraries and community centres, and no more paying carers looking after the elderly and vulnerable bargain basement wages. UNISON‘s manifesto urges existing and prospective councillors to say no to outsourcing, and no to the spending of taxpayers’ money on private consultants who then advise on how to make cuts. UNISON also wants candidates to ensure staff providing local government services are paid at least the real living wage (£8.45 an hour in Wales).